After a day of sightseeing, we prepared for the train ride. The apartment checkout was at 11 a.m., an unusual time, and the train arrived at 3:00 p.m. The van, nice as it was, would only hold us and our personal luggage. Multiple trips up and down Bundesalle ( that’s a German street name for the German street we were driving on), from the station, to the apartment. No problem, we’ve probably all played leap-frog before. That reminds me of the time when my family was at the beach… Uh, nevermind, back to Germany. So, we began our game at 9:30. I took the team and their luggage to the terminal where we had to get all the luggage to the platform on the second floor. No porters, no carts, and I could only illegally park within about fifty feet of the station door, nearest our platform. We dropped Richard and the ladies, while V and I returned to the scene of the cr… I mean, the apartment. Donna, Stephanie, and Richard took their luggage upstairs, as Lena waited on the curb with hers, Vitaly's, and mine. But, Lena, being a thinker, would use a roller suitcase to transport others on top of it. She could watch the bags, while dragging to the escalator, where Richard and Stephanie would remove the bags at the top, and move them to where Donna was sitting guard. The ever efficient bucket line, if you will. This exercise was repeated 4 times in the -4.0 C weather, as we made the trips back to the apartment. 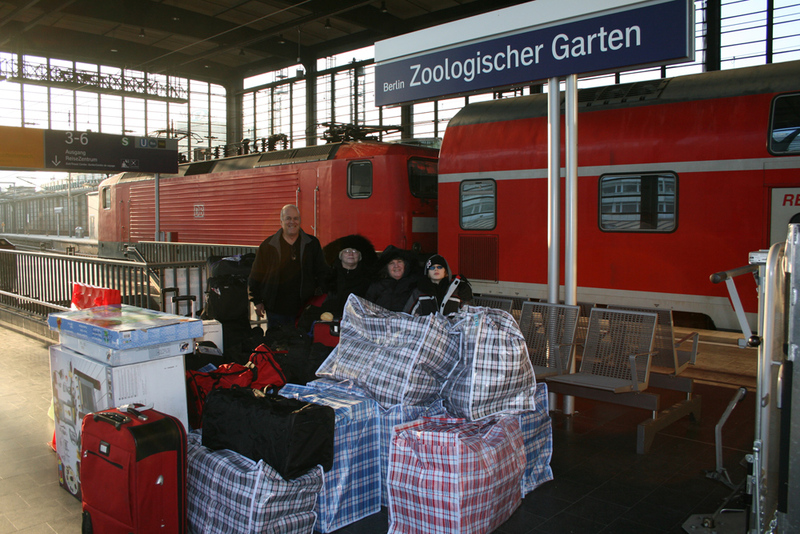 Ok, we were all loaded up at the train station. Things were going great. Time to return the van. So, it seemed like an odd time to contemplate murder, huh? Yeah, well, just let me get my hands around Mr. Google's neck. Him and his bigshot mapmaker, huh! Interesting thing, that Google map. Seems like the Berlin Street Department has misnamed several streets. I was, oh, one mile, maybe two, from the rent car return location. I had 3 hours to turn it in, and take a taxi back to the train station. Easy peasy. Just follow the yellow brick road. Whoops, they don't appear on the ground in any manner they appear on the map. In fact, some of them must have been built on, as they were not on the ground. Upon finding some of them, they run up and down instead of back and forth. Simply put, the map was totally useless. After a couple of hours, really, I was back at the train station, still driving the van. No problem. Being an Amazing Race wannabe, I went to the taxi at the head of the line. I showed him the address I needed to get to, "Lead me there, I'll drop the van off, you bring me back here, Ok?" "OK."
Mr. Taxi leads me to the busiest street in Berlin, just a few blocks from the Brandenburg Gate. Rent car return? I don't think so. He pulls up in front of a hotel, in a no parking zone. He informs me he will wait there, while I go around the block and turn in the van. So, around the corner I go. No Budget sign anywhere. Why should it be there? I am in the middle of posh shops, as in a Ferrari dealer, diamond shops, and such shiny trinkets. Budget rent a car, NOT! I'm running out of get to the train on time time, and I'm running out of minutes on cell phone time. I called Budget, at the airport, where we picked up the van. She assured me it was the right address. Around the block, again. Being the friendly sort, I honked and waved, as I passed my taxi driver. Nope, no Budget for blocks around. So, I called her again, told her of the shops, but no Budget. Aha! Just like Russia. If you don't mind asking the right question, they don't mind giving the info. But, rules are rules, you must be specific. "Where, exactly, is the location, exactly?" "Do you see the Westin Hotel?" "Yes, I see the Westin Hotel." "Do you see a parking garage across the street?" "Yes, I see the parking garage across the street." "Turn into the parking garage, and turn in the key in front of the Westin Hotel." Ok, so add one more name to my list. Sure enough, if you pull into the garage, there it is on the back wall, Budget Car Rental. Now, I ask you, how could I have missed that? I'm not even going to mention the sign that said Budget vehicles go on the 6th level. The van scraped the top of the ceiling going up to the first parking level. The second would have taken out the windshield. Oh, yeah, that three hours to turn in the van? I used about two and a half. When I got back, I told Donna, I could just see it. I wasn't missing the train. Running out of time, running out of minutes, I was gonna have to abandon the van, get to the station, and call Budget from Moscow. "Hey, lady. You know that van you rented me? Well, good luck, it's somewhere in Berlin. Key's in it. I'm somewhere in Russia." I'm not sure if the extra insurance covered such. Oh, well. All's well, that ends well. Or, so they say. I thought, “Woohoo! I don’t have to move the stuff upstairs.” No good deed goes unpunished, nor does any missed work. All the bags and stuff were neatly piled, ready for the train. Hmmm… The ticket says we are in car A257. We are sitting in Zone C. Zone A is wa-a-a-a-a-a-y down there, past Zone B. Rats! Again, I say, Rats! We need to move it all down there. We purchased our tickets for the old train station because we were told it was the beginning of the route. Uh...they lied, it was a pass through. The train is scheduled to be in the station for 15 minutes, which is 10-12 minutes longer than most stops. We had a lot of stuff to load around passengers getting off and others getting on. “Let’s move it.” Never question my wisdom. One good thing is the signs on the platforms show you a complete train layout, car numbers and all. Yep, it shows our car to be the second one in Zone A. So, we moved down to between B and A. I was still a little bit concerned about how far we are from A. As a couple of cops walk by, I asked one if the diagram is correct about where the train will stop. He said the train will stop with our car down in A. We need to move, again. Never question my wisdom. By the time we get it moved again, Vitaly and I are without coats, sweating in -4C. Smile, it’s the Lord’s work. But, we are ready for the door to open on A257. Well, it seemed like a good idea. We even had expert advice from the police. I guess they should have been at the donut shop. Oh goody! Finally! Here come da train, here come da train, here…there go da train, there go da train. I guess, by now, it would be silly to ask if you have any idea where the door of A257 came to a stop, and opened, huh? We all picked up luggage and ran to Zone C, right where it all originally sat. Vitaly, Lena, and I had 15 minutes to move and load 7 large pieces of luggage, 6 carry-ons, 10 huge ugly bags of toys and hoodies, a large children’s playhouse, in pieces, taken out of the box, as it was too big to negotiate train corridors, a large child’s kitchen, 3 duffels of food for the train, 2 duffels of more toys, puppet theater, and doll buggy. Problem? No problem. Just move it all again, this time loading it on the train. V and I threw the luggage into the train door, to Lena, who was waiting to cram it into one of our 4 cabins. It helps to have a young, pretty (and strong) woman with you (don’t worry, Donna and Stephanie will never see this part), when you need extra help. The conductor took note of her, and helped her lift the large bags onto the train. We made it! We even had a few minutes to spare. Our worries are over, right? I mean, what else do we have to do? We be loaded. Right? Uh…three borders to cross, each with their rules and limits (and no way to know any of them ahead of time.) We are at the mercy of each customs and immigration officer. You know, kinda like the airline counter agents, each with their own idea of the rules.